Okay, you know all those websites that supposedly teach you how to read at incredible speed? They ususally focus on things like cutting down on sub-vocalizations (the hearing of the words you’re reading in your head) in order to limit the time it takes for the brain to process the written word. 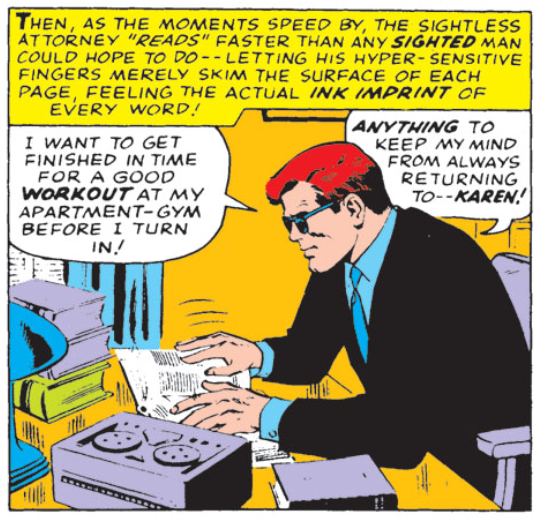 Little do they know that Stan Lee solved this problem back in Daredevil #15. It’s not our brains that keep us from reading faster, it’s our eyes. That’s right. If we could all just learn how to read print by touch we would read much faster. Below we see Matt Murdock doing just that. Why bother with Braille for “appearances” when you can speed-read print? Just scan it with your fingers in apparently a fraction of the time it takes to scan it with your eyes! Another thing, what’s up with the quotation marks around the word “read”? It’s not really reading unless you do it with your eyes? Hmmm….